The contrasting solids are just cheap ($2.50/m) cotton from my local fabric shop. The main fabric is locally made Thai cotton which is actually a maxi skirt. i.e. a tube of fabric with one seam up the back. I have had it for years so I can’t remember where I got it (probably Chaing Mai night bazaar) or what I paid for it (probably about $10). You can find similar(ish) Thai cottons here in my etsy shop. Have a browse, maybe you’ll find something you like. I also plan to use #makeagarmentamonth on social media so why don’t you too, then we can all follow along on Twitter or Instagram or both. Lots of other plans brewing (that may involve a yellow skirt) but more on that later. Here’s to a productive month everyone. 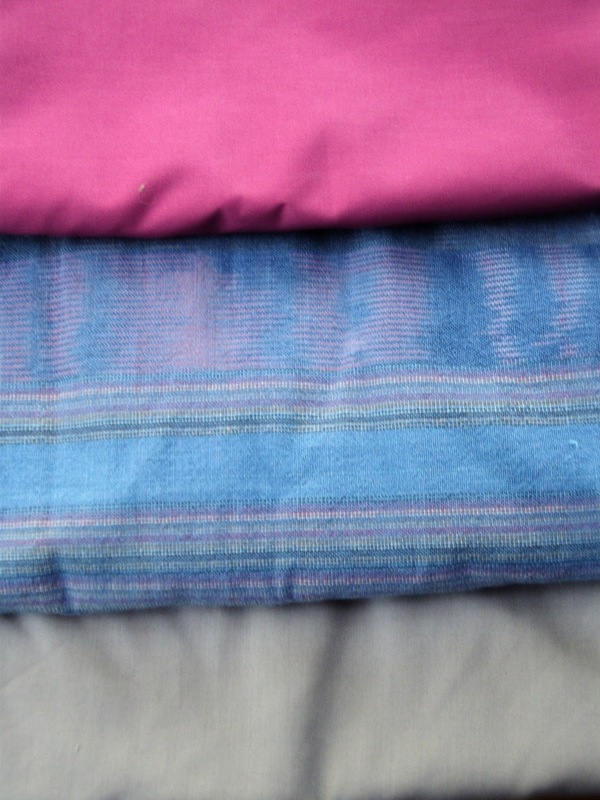 Hi Gaye – the fabrics are lovely – you must have quite a long association with Thailand. I've long liked that particular Vogue dress as well, but there isn't time to make them all – so it's nice to see others make them up. I haven't moved into the whole social media thing yet, – that's my next learning exercise… I think I remember, from looking at your other blog, that you use it quite a bit. Hi Sarah Liz – yes, I came to Thailand 13 years ago but spent 6 of those years in the Middle East before returning here 2 years ago. It's now home. And because of the fabrics such a lovely place to sew. I wouldn't say that I use social media a lot but I have known of it and its potential for a long time. Now I'm moving into trying to actually use it more – have just started using twitter and instagram. So will be using them for #makeagarmentamonth – it's such a great challenge, thanks to you, and so I figure we should spread the word. Hi Gaye, I've had a few days away, so just caught up with your reply. You are quite adventurous. By the end of the year I hope to have learned a little more about social media and have it incorporated into the challenge. I think you'll find that people will start using social media for the challenge anyway and it may just happen on its own. It will be interesting to see what happens….